The Best Spots for Gelato in Wyoming! Gelato simply means “frozen.” But that simple translation belies the delicious complexity of this 17th-century, Italian-born confection. This treat contains less cream, eggs and air than its more common cousin, resulting in a denser, more decadent, and often, a less caloric, dessert. Here are the best places to get gelato in Wyoming. The term “atelier” refers to an artist’s studio. And in few other places is the term “art” more applicable than at Atelier Ortega, food or otherwise. The genius of the Mexico-born and European-trained master chocolatier is renowned, both in Jackson Hole and the culinary world writ large. World class confections are dutifully and passionately sculpted in this kitchen, amalgamating a well-earned collection of talented and experienced artists. While certainly less a plain ice cream destination, one of its cornerstones is gelato. It’s supremely creamy, dense and decadent; unique and nostalgic simultaneously, crafted by none other than a World Gelato Cup champion. Who would’ve thought some the best sweets resided in Wyoming’s mountains? Located right by the University of Wyoming, this family-run cafe has wonderful soups, salads, and sandwiches to choose from. 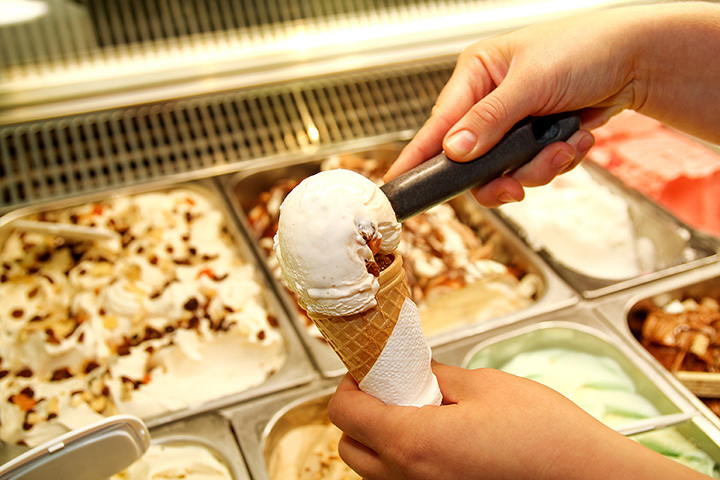 Don’t forget to finish off your meal with their fantastic gelato, made from the highest quality ingredients! They have all kinds of exotic flavors. Big Dipper takes ice cream cravings seriously. The website says so. It’s no surprise, then, that the creamy confections here are no joke. Upon entering this Laramie shop, the display case is immediately welcoming: a cornucopia of long hotel pans brimming with dozens of colorful and decadent offerings that almost shimmer in daylight. The delicious flavors of ice cream and sorbets touch all the bases: tart, fruity, creamy, chocolatey, salty, crunchy, et al. And unlike many competitors, the menu here includes a nice list of real gelato, all made in-house. Notable menu items are the herbaceous and earthy green tea, the tart-fresh orange creamsicle, and a buttery sweet-salty popcorn. Head over to Glorietta Trattoria for dessert and you won’t be disappointed. After you’ve indulged in their delicious dinner menu, with options ranging from confit rabbit and hanger steak, make sure you dig into their delicious gelato. They have a delicious assortment of flavors along with desserts like apple pie, zeppole, and tiramisu.